Creating and printing posters, self-initiated or on a commission is something I enjoy making the most. So, therefore, I was quite enthusiastic when it came to collaboration with MIAT museum where 2 different posters had to be designed, typeset from wood and metal type and letterpress printed at the printing department of the museum. 3. British Letterpress. A UK view of Letterpress Printing. 4. Pressing Matters magazine - a new printmaking publication, fresh off the printing press. As the annual Museum Night in Gent was approaching and it became a good tradition among volunteers of the MIAT museum to have a demonstration and giveaway for the public, we (me & Marie-Alice Boshoff) decided to design & print a calendar for the occasion. This year the Museum Night took place on 1st of December and the MIAT opened its doors till 01 o'clock inviting visitors to attend its new exhibition 'Made by Children. Child Labor Then and Now', music performance by Wannes Cappelle, various demonstration and the recently opened Bar Mitte. Last Sunday new exhibition opened its doors to the public at the MIAT museum - 'Made by children. Child labor then and now'. This exhibition gives child labour a face by presenting a striking personal stories of 14 children, aged from 8 to 14. Some of the stories are of children here in Belgium, some are of children from the abroad, some stories relate to the past, others to the present. 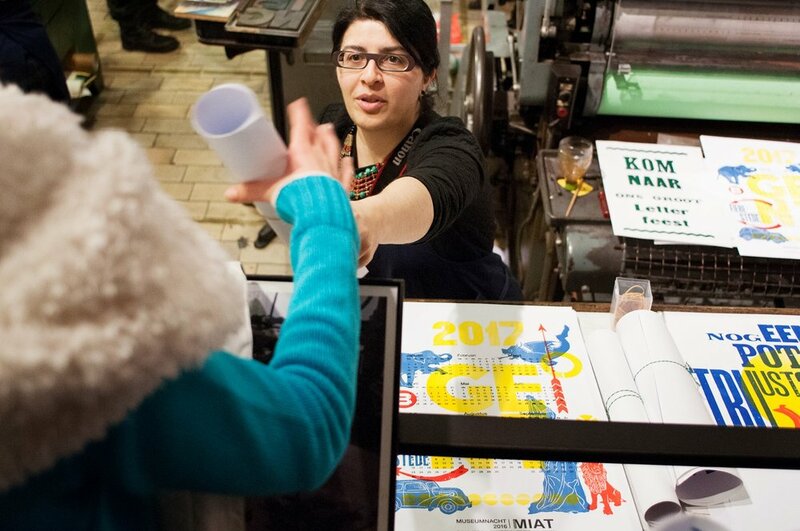 Last Saturday the annual Cultural Fair in Gent marked the start of a new cultural season. Traditionally, more than a hundred organizations were gathered on one of the main squares of Gent - Kouter to put the new cultural season in the spotlight. So did we with the MIAT museum!